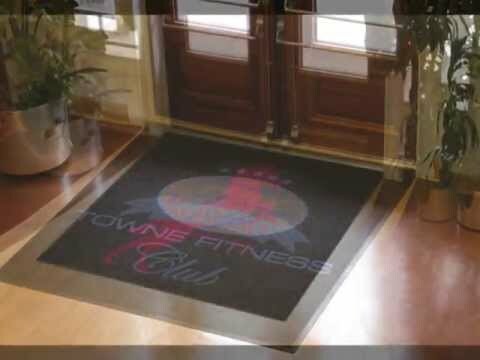 Put your company logo or any message on the industry's finest indoor/outdoor mat. All rubber logo mat. Images are permanently molded into the mat. 18 colors available. Place up to 5 colors per mat. Excellent durability and traction properties. Provides a slip-resistant surface which effectively removes tough dirt, grime and water from feet. Green friendly rubber backing has 20% recycled rubber content. Certified slip resistant by the National Floor Safety Institute. Square "waffle" design. Not adversely effected by salt or ice melt. Durable polypropylene face suitable for indoor or outdoor use. Polypropylene fiber system dries quickly preventing fading and rotting. Waterhog[TM] Inlays are available with Waterhog[TM] Classic rubber border or Waterhog[TM] Fashion Fabric border. Available Sizes: 2' x 3', 3' x 4', 3' x 5', 3' x 10', 3' x 12', 3' x 16', 3' x 20', 4' x 6', 4' x 8', 4' x 10', 4' x 12', 4' x 16', 4' x 20', 6' x 8', 6' x 12', 6' x 16', 6' x 20'.